When it comes to buying hardware — switches, storage systems, routers and voice systems — companies are buying a lot more, but paying a lot less, according to new data from Synergy Research Group. During the first quarter of the year revenue at enterprise-oriented vendors was down by as much as 11 percent year on year in some of the major markets. What is the problem? 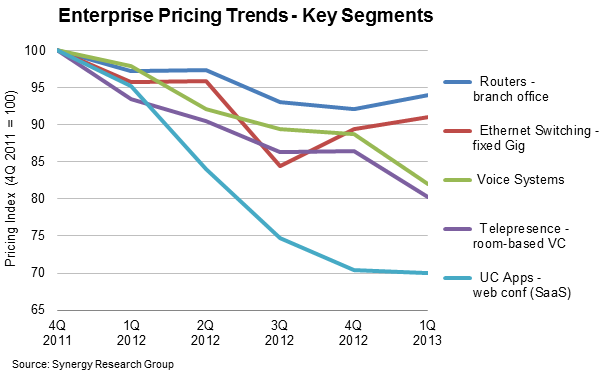 Hyper competition, which is leading to rampant price cuts — some of the largest enterprise market segments prices nosedived, down by an average 17 percent since the end of 2011. A lot of that has to do with the fact that Asian companies such as Asus have started to go direct to market and do an end-run around the premium-charging brand names. These companies have also started to offer more complex solutions. The problems are likely to spread to even higher end markets as more open standards start to become pervasive.